2016 Sea Ray 510 Fly This is the best 510 on the market loaded with all the upgrades. The owner has moved up and is a two boat owner. 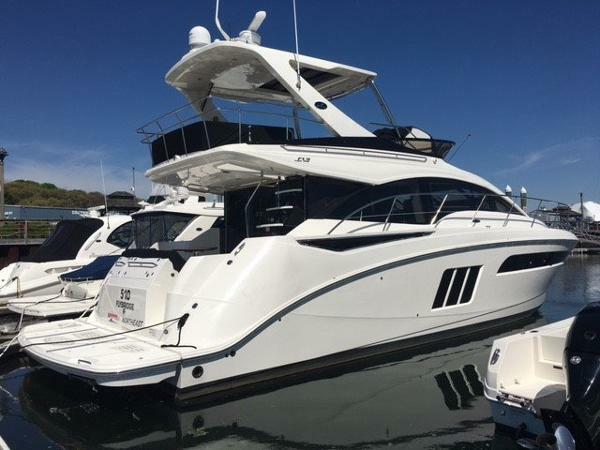 Now is your opportunity to make a deal.This is a must see boat located in San Diego's ready to view at your convenience. 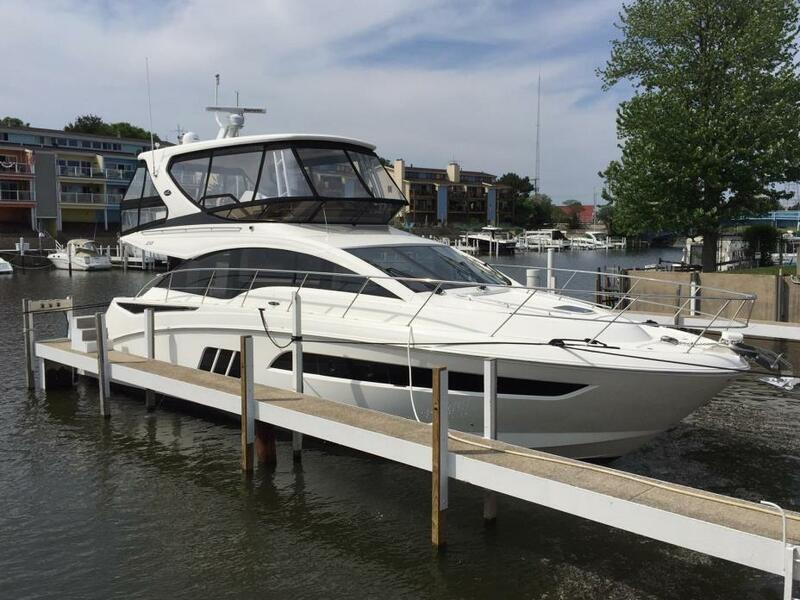 Like new 2016 Sea Ray 510 Fly. L Class upgrades with Gyroscopic Stabilizer, gen set upgrade. Held in LLC! 2017 Sea Ray Sport 510 Fly 2017 Sea Ray 510 Fly, T Zeus 600 QSC T3 Diesels, White hull, Black canvas, 120/240 Vac/60 cycle electrical system, French walnut wood blind upgrade, Teak flooring in cockpit and bridge, Teak flooring on deck catwalks and swim platform, Stainless steel finish for sunroom entryway door, Opening portlights in each stateroom, Interior carpet runners, Wine cooler, Opposing seating in master stateroom, Fridge/Freezer upgrade drawer style, China place settings with storage, Cabin audio upgrade bose speakers, KVH HD7 antenna for true HD programming, Flat screen TV w/DVD & gaming port in mid stateroom, Inverter 120v/60 cycle, Washer/dryer combo, Macerator with seacock interlock system, Windshield w/manual opening side window, Hardtop with lighting/sunroof/retracablet canvas, Bridge cover canvas, Grill & sink on bridge, Natural teak table on bridge, Natural teak forward port table, Aft facing bridge camera, Lower helm dash canvas cover, Mesh windshield shade canvas, Exterior audio upgrade, Cockpit seating additional portside, Cockpit icemaker, Underwater transom lighting, Cockpit rod holders, Hydraulic swim platform 1000LB capacity, Yacht flag & flag pole, Gyroscopic stabilizer, Raymarine GS125 (3 displays), Multi station docking system - cockpit controls - Zeus, Stainless steel anchor, Windlass all chain, Oil changer system. 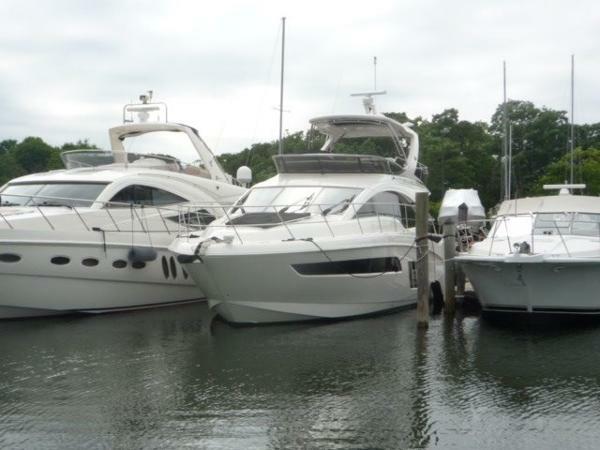 2014 Sea Ray 510 Fly Carol Ann is a gorgeous 2014 Sea Ray 510 Flybridge with only 298 hours on the preferred Cummins V drives. She has been shed kept since new and professionally maintained to the highest standards. She has all the right options - JOY STICK controlled inboards with Bow and Stern thrusters, iPad controlled Audio Visual systems, Hydraulic Swim platform, Raymarine hybrid touch screen Radar/GPS/Plotters at the upper and lower helms, DSS Satellite TV, 17 KW Onan Generator, FLIR Night vision, Aft back up and engine room cameras, under water lights, and a large forward deck sun pad. SHE HAS EXTENDED WARRANTIES THROUGH SEPTEMBER 1, 2020 Why pay new boat pricing when you can have a shed kept one owner boat with extended warranties for thousands less??? 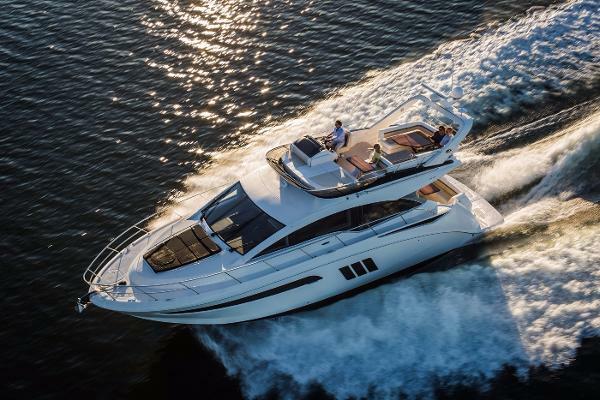 2017 Sea Ray 510 Fly Think of consummate hosts you've met. They support social interaction with beautiful settings and all the right amenities and offerings to bring life to the party, keeping the mood bright, lively and happy. You've just imagined the Fly 510, with its highly functional social zones and crowd-pleasing features to keep you and your guests at full-smile. SkyFlow Design™ circulates light and air throughout the boat. The galley, salon and cockpit combine like an indoor/outdoor great room, and the expansive bridge layout is the icing on the cake. Hosting is easy in such an environment. And then when the pace has slackened, a full-beam master suite breathes peace into every weekend getaway. 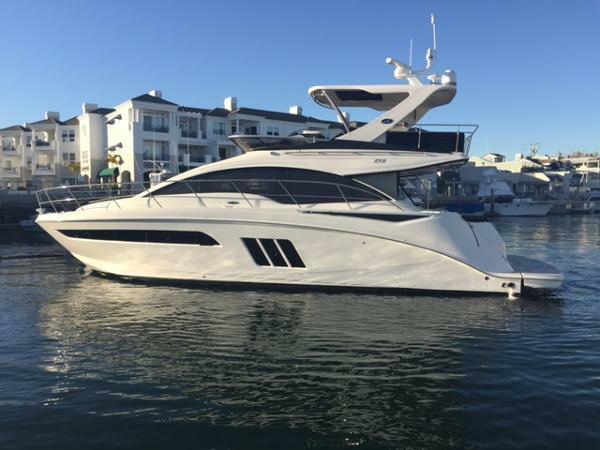 2017 Sea Ray 510 Fly Think of consummate hosts you've met. They support social interaction with beautiful settings and all the right amenities and offerings to bring life to the party, keeping the mood bright, lively and happy. You've just imagined the Fly 510, with its highly functional social zones and crowd-pleasing features to keep you and your guests at full-smile. SkyFlow Design circulates light and air throughout the boat. The galley, salon and cockpit combine like an indoor/outdoor great room, and the expansive bridge layout is the icing on the cake. Hosting is easy in such an environment. And then when the pace has slackened, a full-beam master suite breathes peace into every weekend getaway. 2016 Sea Ray 510 Fly Like new 2016 Sea Ray 510 Fly. L Class upgrades with Gyroscopic Stabilizer, gen set upgrade. The boat is in as new condition, the owner is moving up to a larger boat. 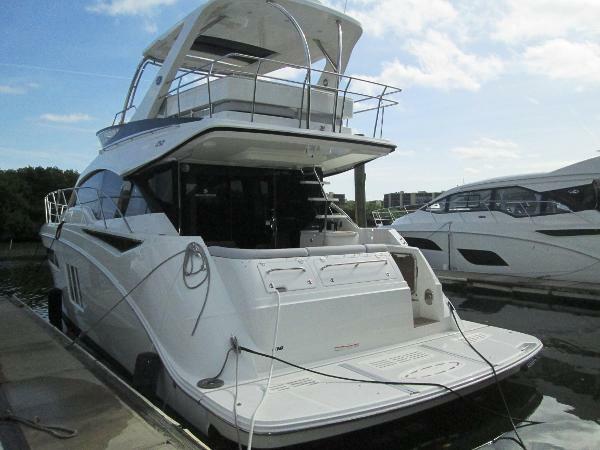 2014 Sea Ray 510 Fly This 510 Fly is very clean and loaded with optional equipment. 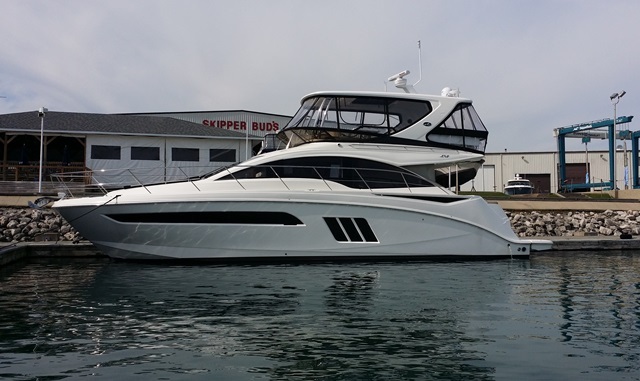 The 510 Fly is a 3 stateroom boat with a full beam master stateroom. Upgraded Cummins 715 QSM 11's with v-drive inboard shafts. Upgraded inboard Joystick docking system with bow and stern thrusters. She has only 396 hours. Other optional equipment includes; Marine hydraulic platform for a tender. Stainless steel cabin entry door, salon ottoman, pull-out salon sofa bed, interior carpet runners, high gloss teak cockpit table. Upgraded refrigerator and freezer option to drop in stainless steel, washer/drier combo and central vacuum system. Forward stateroom TV/DVD, 3rd stateroom TV/DVD, DSS Sat TV system, Exterior Audio Upgrade for cockpit and bridge, Upgraded Raymarine GS125 units with radar on upper and lower helm, auto pilot, remote spotlight and Aft facing bridge camera, Electric grill and sink on bridge, cockpit ice maker, bimini top, mesh windshield shades. Upgraded 17kw generator. Windless all chain, stainless steel anchor and oil change system for motors. 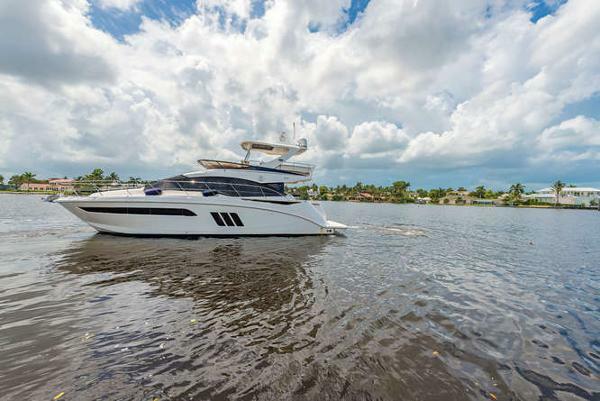 This vessel is easily seen by appointment at our Marine Max Fort Myers location. Call Brian Kemmis for your viewing appointment. 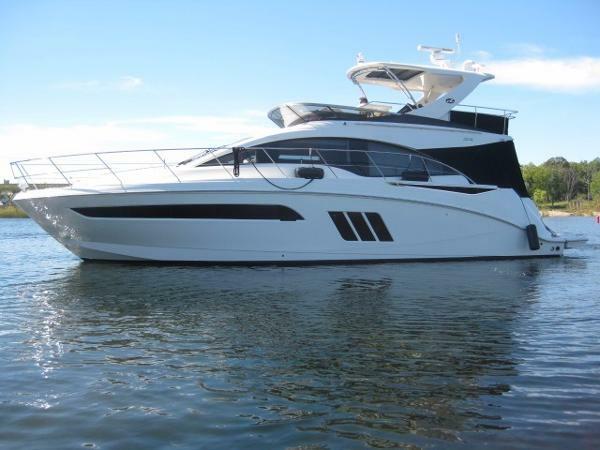 Financing is available thru our Marine Max Fort Myers Office. 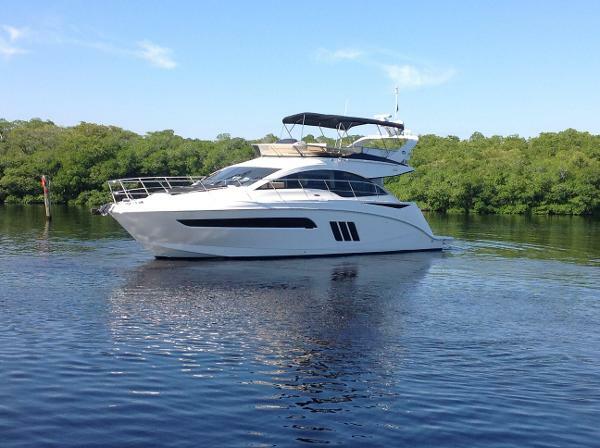 2016 Sea Ray 510 Fly - CALL FOR APPT. Model 510 Fly - CALL FOR APPT. 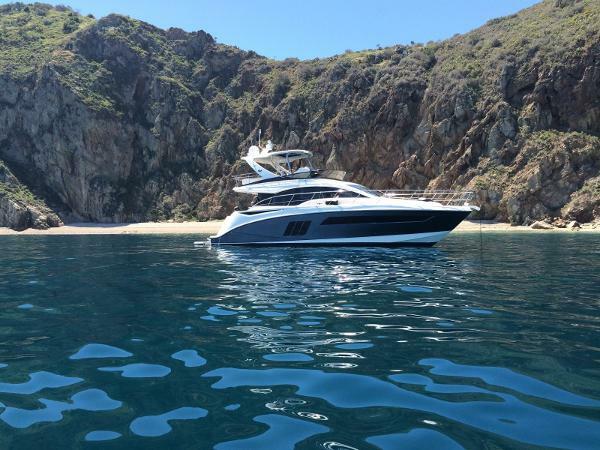 2016 Sea Ray 510 Fly - CALL FOR APPT., MUST CALL FOR APPOINTMENT - YACHT IS NOT AT OUR FACILITY. 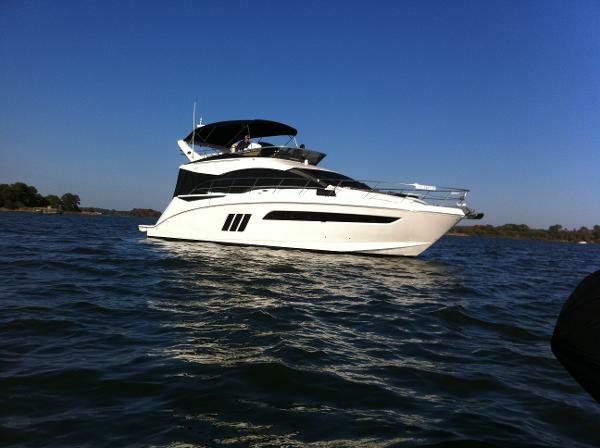 T/ Zeus 600 QSC T3 574HP Diesels, White Hull, Black canvas, Interior SY A tan/taupe/honey, Int. package A light carpet & Light Cherry wood blinds, Salon ottoman, Salon sofa w/ pullout bed, Interior carpet runners, Refrigerator/Freezer upgrade galley drawers style, Cabin Audio Upgrade HK/Bose Speaker, DSS Satellite TV System, TV w/ DVD/Gaming Port - mid stateroom, Transformer Shore Power ISO Boost, Washer/Dryer combo, Windshield w/manual opening side window, Ext hardtop w/ lighting/sunroof/canvas encl/ac, Carpet liner-bridge, Grill & sink on bridge, Table-high gloss teak-aft area on bridge, Table-high gloss teak-fwd port area bridge, Aft facing bridge camera, Canvas-mesh windshield shades, Ext audio upgrade-cockpit & bridge, Ice maker-cockpit, Teak flooring-cockpit & bridge steps, Lighting-underwater transom, Hydraulic swim platform, Yacht flag & pole, Lower & Upper helm RM E125 Chart/Aux display, Anchor-Stainless steel. 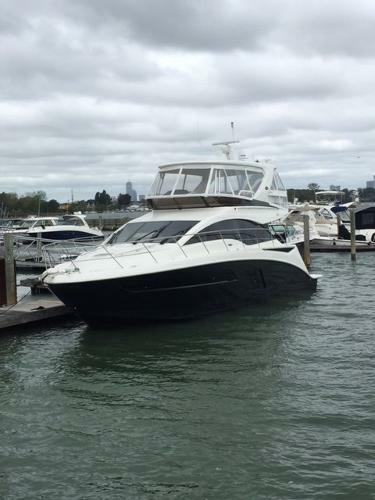 2015 Sea Ray 510 Fly Lightly pre-owned Sea Ray 510 Fly. Featuring beautiful cherry wood in a spacious salon and 3 staterooms and 2 heads Powered with Cummins engines with Zeus drives.Options included are Sea Keeper gyro, full Raymarine package, Flir night vision, Satellite TV, Hydraulic swim platform. Owned in an LLC. and transferable warranties. 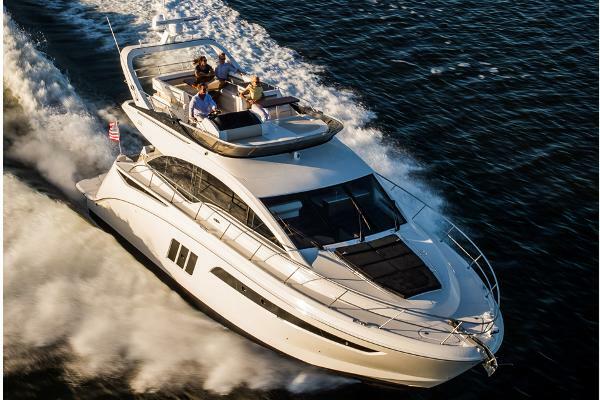 Come see why Sea Ray Hit a home run with this model.